It has been 10 months, and we have something amazing to share, thanks to Joshua’s teammates! Seeing pictures of Joshua’s friends playing football together and not seeing number 54 on the field is hard. Playing football was something he loved to do. He would go on and on about certain plays that were “his plays” and he would get so excited about telling us stories about practice and games. 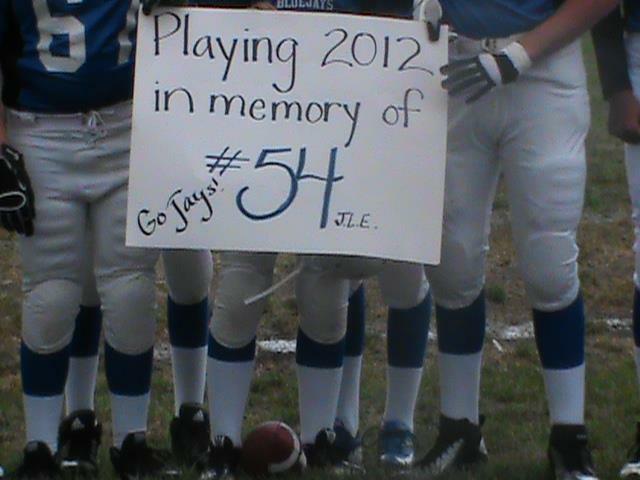 Joshua’s team is taking a sign that says “Playing 2012 in Memory of #54”. When I first saw a picture of the team holding this sign I couldn’t hold back tears. They were tears not only of sadness, but also tears of joy. The proud sister moment happened there. They “retired” Joshua’s football jersey and gave it to our family. It is an awesome thing of his to have. 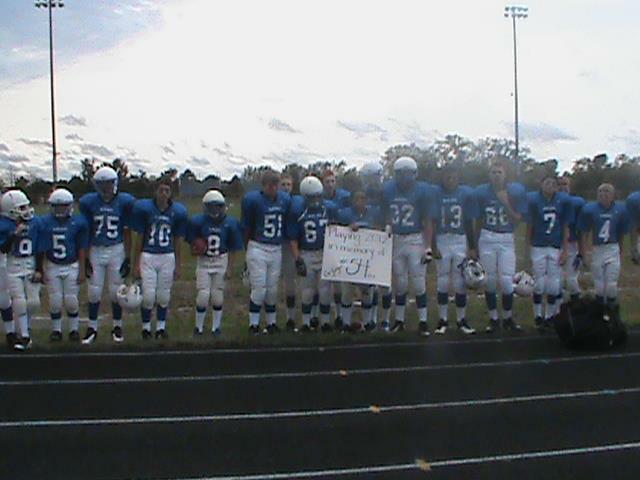 We would like to wish the team the best of luck on their 2012 football season, and the rest of their seasons to come. Joshua would want you boys to play hard and win big. You will always have a cheerleader watching down and wishing you the best. We appreciate what you are doing. Good luck! Bondurant has some really good kids.. Joshua is still in the\ier hearts and minds and always will be. Go BlueJays!